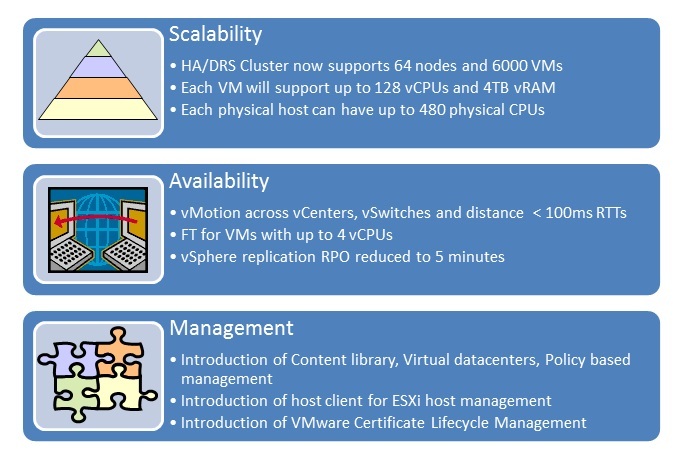 The most awaited VMware vSphere 6.0 is finally here.The public beta was announced sometime around July 2014 and thousands of interested folks tested and analyzed the products and their new features. VMware fixed a lot of bugs and also changed some features here and there to make it fit for the final release. Everyone had lot of expectations and asks from this new version. I feel the product teams have put enough effort to do what they do best and make sure the technology supports and works along with the current market trend and also addresses all the pain points existing customers are going thorough. There are lot of improvements this time around and we’ll see what they are in this blog post. Personally i was a big fan of the vSphere client so i feel a little bad about that going away. But we all saw it happening as some of the functionality were already offloaded to web client from version 5.5. It’s a great improvement in the scalability area as we see the cluster capability has gone up to handling 64 nodes. The Maximums have increased like they always do with the new versions. In the management and availability bit, i love the new features such as Content library, VDCs and PBM. It’s a delight to see FT fiinally supporting 4vCPUs. vMotion across vCenters is something everyone always asked for and so is long distance migration. Storage IO Controls can be adjusted at Virtual Machine level to guarantee minimum service levels. Virtual Volumes (VVol) – Existing SAN/NAS systems become VM aware making the VMDK files directly sit on SAN/NAS. New APIs for data operations at the VMDK granularity. NFSv4.1 with Kerberos Support NFSv4.1 in the storage. ESX will now support the NFSv4.1 client, which connects to an NFSv4.1 server. Kerberos which is a security feature of NFSv4.1 is also supported. App HA supports more business critical applications. Some bug fixes and enhancements in scripted installation of vCenter etc are add ons to these bigger changes. I feel they have covered all the possible areas of improvements in this version. Looking forward to test all the capabilities in production and see how well they solve the customers’ problems.